Jazz and I had the opportunity to go with our friend Susan Zimmerman and her Dal Ripley out to Ohio to the home of Linda Lombardi to train with Linda and her awesome horse Zippity. Linda has three Dals and lots of Road Trial experience. She was very encouraging and a huge help to me and Jazz today. Susan and Ripley show us how it's done. These two got their Road Dog and Road Dog Excellent titles in the course of one year! A big part of training for a Road Trial is focus and attention. Jazz did an awesome job, given that we were in a new location and working with a horse she had never met before today. Here's Jazz "hocking" or gaiting along with me and Zippity. It's amazing how naturally this comes to Dals with very little prompting. Part of the Road Trial exercises include a sit or down stay. It is recommended (but not required) that the rider move away from the dog a bit during this exercise in case the horse becomes impatient or fidgety during the stay. When you return to the dog after the stay, you return around the back of the dog and then back into "heel" position, just as you would in obedience. While Jazz kept an eye on me as Zippity and I went behind her, she held her stay and didn't seem nervous with Zip moving about so close to her. What a thrill for me to ride Zippity and see Jazz hocking along beside us! This is only Jazz's second encounter with a horse and the very first time she's ever tried hocking, both on leash and off. I was incredibly pleased with Jazz's attention and focus and especially with her willingness to work with the horse. Susan noted that her tail and ears were always up and that she truly seemed to enjoy the workout. Many thanks to Susan for her encouragement and help, and especially to Linda for giving up her Sunday afternoon to allow me to ride Zippity and work with Jazz. Regardless of whether we ever make it to a Road Trial, today was a very enjoyable day that I won't forget soon! Believe it or not, long before I became dog-crazy, I was a horse-crazy young girl, especially Appaloosas. My love for spots actually developed before Dalmatians! Recently, I've decided to combine my love for Dalmatians with my long-ago love for horses and start to train Jazz to compete in a Dalmatian Road Trial. For those of you who aren't familiar with Road Trials, The Dalmatian Club of America describes it as a performance event designed to evaluate the Dalmatian's ability to "coach" or follow the horses. Exhibitors compete as a handler on horseback or in a horse-drawn cart or carriage, with dogs off leash. In our case, it would be with me on horseback and Jazz coaching for 12.5 miles! Our goal is to enter the Road Trial at the DCA Nationals at the end of next April. Obviously, a trek of this distance requires much stamina and endurance. As with any athlete, it takes a lot of training to reach your goals. That's why Jazz and I are starting a year in advance! The first step we've taken is to build Jazz's core strength by working on fitness balls. This will help prevent injuries during our endurance training. Here's Jazz doing a nice stretch on the fitness ball. Here's Jazz sitting on the fitness ball. She's now mastered going from a sit to a down and back to a sit on the ball! She can also put her back feet on the ball and her front feet on my shoulders. We keep teasing that Jazz's brown parts must be monkey!! She's just loving this phase of our training, and I think it's also helping to build her confidence. Jazz and I have also been walking several times a week, and we are ready to start biking. I just got a spring mechanism that attaches to the bike that, in addition to keeping both Jazz and me safe, will teach Jazz the proper position for "hocking" or coaching beside the horse. Many thanks to Mariann for lending me her bike! So, the one very important piece missing from this Road Trial equation is the horse! Unfortunately, we do not have a horse, and we're about four acres short of being allowed to own a horse in the township where we live. Once again, Jim and Mariann came to the rescue by introducing me and Jazz to their niece Amy, who owns four awesome, well mannered horses. Jazz had her first up close meet and greet with Amy's horses last evening...and she did great! She was very calm around them, yet very interested. We are really looking forward to doing more work with Amy and her equine beauties. Amy is an excellent horsewoman who also owns a cool search and rescue Lab named Murphy. Say hi to Murphy, who patiently waited in the car so Jazz could concentrate on getting to know the horses. Here's Jazz getting to know Belle, a sweet, gentle 18-year-old mare. Didn't take long for Jazz to get up close and personal with Belle, who was as interested in Jazz as Jazz was in her! Here's Jazz and Ricky, Amy's handsome young gelding. I don't know if I was more excited that Jazz did well with these horses or just excited for me to be around horses again! We thoroughly enjoyed our visit with Amy and her horses (thanks, Jim, for hooking us up and for taking the awesome photos), and I'm thrilled to have the opportunity to train Jazz to do what Dalmatians were bred to do. Stay tuned...we have a lot of work ahead of us to make this a reality! 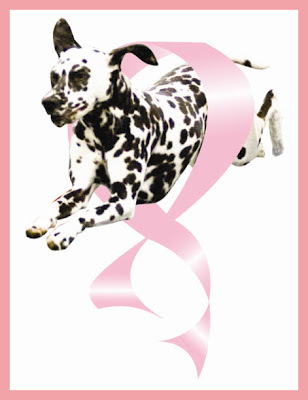 I have spent much of the past year raising funds for breast cancer research and awareness through Spot a Cure. Many of you have helped by purchasing t-shirts, sweatshirts, or scarves. Thank you! When designating an amount for your donation in PayPal, be sure to click on "Please tell us about your donation" and type in the word "Race" in that field, along with your name and any text you wish to include so that we may recognize your donation on the Spot a Cure website. I have learned many startling statistics through my work with Spot a Cure. One in seven women will be diagnosed with breast cancer in their lifetime, so the woman you save by making a donation could be you or someone you love!! Also, three of four cases of breast cancer arise in women with no known risk factors, so please be diligent about those self breast exams and mammograms! Nearly all breast cancers can be treated successfully if found early. When breast cancer is found at its earliest stage, the five-year survival rate is 98%. Help us continue the fight against breast cancer with your donation to the Komen Pittsburgh Race for the Cure. I know that things are still tough economically, but any little bit helps! I would like nothing more than for Spot a Cure to become obsolete when a cure for breast cancer is found!!! Being another year older isn't so tough when you get to munch on doggie birthday cake! Happy Birthday, Tess...and many more! !